"The time of our lives..."
A famous quotes is “Time is Money” but is it? In this world, we live within time and space which are of course both Creations of Allah (subhana wa ta’ala). So we are bound by space and time. But do we ever give the appropriate importance to our time? I know we always say “I must make time for this and time for that… time to go to work, time to make money, time costs money, time is money and so on. ” This is not what I mean. Are we getting our priorities right as with regards to time? How are you spending your time today? Do you know why you was given today, did you appreciate this day, that Allah (subhana wa ta’ala) blessed you with and what did you do with your time? We have to reflect on our purpose in life and why we have been given time in our lives, however much time Allah (subhana wa ta’ala) will permit us with. Worshipping Allah not only on when we perform our prayers but doing every action of our lives for His sake and to please Him. Once we grasp the truth and purpose of our existence then it is possible for us to appreciate and use our time correctly. Imam Shafi’i said,”Out of my company with Sufis, I benefited only two things, one of which is their saying: like a sword, time will cut you if you do not cut it. …” In other words, if you do not spend time doing something useful, you are the loser by wasting it. 5) Your life before your death. If you live until the evening, then do not expect to live until the following morning. And if you live until the morning, then do not expect to see the evening. Take from your health for your sickness and from your life for your death. What are we waiting for? More time? Lets hasten to do good! View more presentations from Xenia Yasmin. Muslims love Jesus (as) too.. I have come across some comments where the commentators after reading a few verses of the Qur’an which is usually done out of context,all of a sudden feel confident to pass their own negative interpretations as solid and unmistakeable. One of the comments that I remember is that and I will not specify , that some Muslim men marry other faith women in order to convert them and by procreating increase the Muslim population. Now this is something that I found somewhat strange. I am sure it would be hassle free and much simpler to get married to a Muslim woman. It is easy to comprehend that you can not compel anyone in matters of Religion. Believing in Allah (swt) and worshipping Him alone is a very personal matter and a matter of the heart. How can anyone convert anybody? 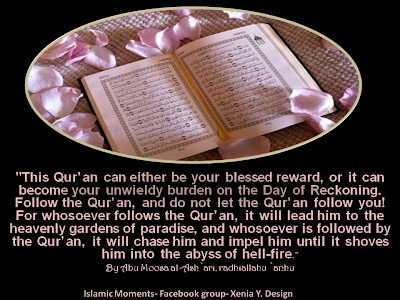 The Qur’an recognizes the right to religious freedom not only in the case of other believers in God, but also in the case of not-believers in God (if they are not aggressing upon Muslims). So for those who ask, the answer is a big no. No Muslim man is ever going to get married to another faith woman for reasons of conversion. Labels: No Compulsion in Islam.. Please select the Full Screen Option from the Menu for a better view. Inshallah you will enjoy the presentation. Do you think it is their fault? For the past few days we are experiencing extreme weather conditions. Bitter cold. snow with more snow expected in the next few days. Some of us are having fun and some of us are complaining about the poor travel conditions and the state of our roads, rail and air disruptions. We are all very anxious to get to our destinations ie home as quickly as possible. Away from the the bitter cold, the wet and the darkness. How many of us though, have spared a thought for those who haven’t got a warm house to go to? People who have not got a home of their own. People sleeping in cold and desolate street benches, under bridges and archways, shop doorways, and so on. Poverty, caused by many factors including unemployment and underemployment. Mental disorder, where mental health services are unavailable or difficult to access. Disability, especially where disability services are nonexistent or poor performing. Relationship breakdown, particularly in relation to young people and their parents. Prison release and re-entry into society. Natural disaster, including but not limited to earthquakes and hurricanes. Forced eviction – In many countries, people lose their homes by government order to make way for newer upscale high rise buildings, roadways, and other governmental needs. The compensation may be minimal, in which case the former occupants cannot find appropriate new housing and become homeless. Reduced access to health care and dental services. Increased risk of suffering from violence and abuse. General rejection or discrimination from other people. Not being seen as suitable for employment. but the very real danger of hypothermia and possible death. So next time you come across a homeless person, especially in these severe weather conditions, please do not hurry to pass by but try to stop and find out if you can help in any small or big way within your capabilities.